1917 was a turbulent year for Russia. Already deeply enmeshed in World War I, there were problems on the home front as well, as the seeds of revolution began to sprout. On New Year’s Day, the body of the “Mad Monk” Rasputin, charismatic healer and confidante of the tsarina, was pulled from the icy river Neva. His daughters, according to his wishes, are placed under the protection of the Romanov royal family. Eighteen-year-old Masha, despite not being gifted with her father’s powers, takes his place at the bedside of the young tsarevitch, Alyosha. The heir to the empire, Alyosha is frequently confined to bed with the effects of his hemophilia, and Masha must do what she can to ease his discomfort. She tells him stories, of her parents and his, but even the most enchanting fictions cannot hide the fact that the Romanovs are under house arrest by the Bolsheviks, and that Alyosha may not survive long enough to die from his disease. 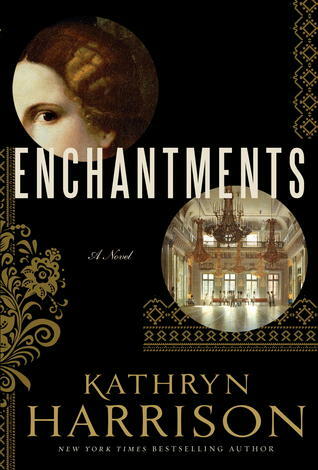 Enchantments is the story of the Russian Revolution, fictionally recounting what happpened to Rasputin's daughters after their father's murder. The tsarina, desperate to grasp on to Rasputin's magical healing powers for her hemophiliac son, takes Masha and her sister to live with them, in the hopes they may possess some of their father's skills. Rasputin's life and murder continue to fascinate to this day. And this is what drew me to this story. Kathryn Harrison did an excellent job of bringing to life the central characters in this story. I enjoyed the historical details and the poignancy she portrayed regarding the royal family at their anticipated demise. She truly is a talented writer who did a great deal of research. Many of her scenes are gripping and so real, they truly stirred a realm of emotions as I read them. In particular is the scene depicting the murder and recovery of Rasputin's death. At times, I wished for more of Rasputin to be brought into the story through flashback or recounting some of his escapades, but I bear in mind how difficult it is to write a novel set in such a complicated era and within the constraints of required novel length. The cover is spectacular and definitely a draw for readers. All in all, this novel is an excellent representation of a most traumatic time in Russia's history and recommended for those who love Russian historical novels. sounds great, I'm adding this one to my read list.